The Achilles tendon (tendo calcaneus, calcanean tendon) is the body’s thickest and strongest tendon. It links the gastrocnemius and soleus muscles to the back of the heel-bone (calcaneus). The outer part of the tendon is very visible from the lower end of the gastrocnemius muscles downwards. You can see and feel it extending down the back of the lower leg, covering about two-thirds of the length of the leg. 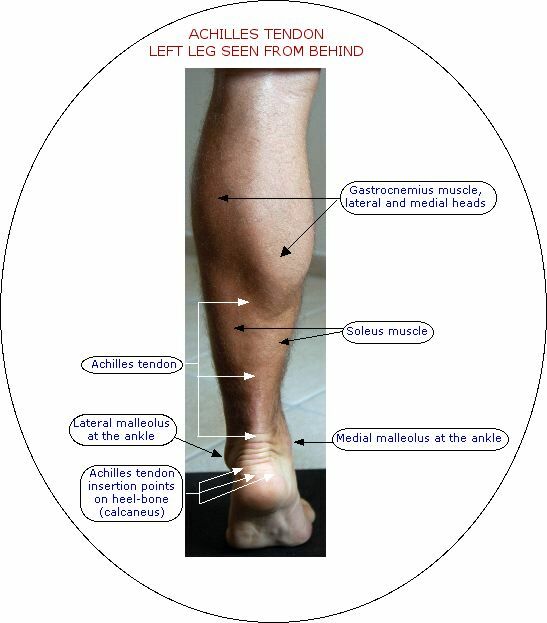 While the two parts of the gastrocnemius muscle join up on to the tendon at their lower end, the soleus muscle feeds in fibres to the inner side of the tendon, almost down its whole length. The tendon looks as though it runs in a straight line down the back of the lower leg. However, its fibres twist outwards in a spiral through 90 degrees as they pass downwards. The fibres linking the gastrocnemius to the heel are attached more towards the outer (lateral) side of the heel-bone, while the soleus fibres are attached to the inner (medial) side of the bone. At its lower end, just above the attachment point on the heel-bone, the tendon becomes thinner and more rounded, There is a kind of triangular “space” between the lower end of the tendon and the underlying structures. Because the tendon is not close to any friction-causing structures, it does not have a fluid-filled (synovial) sheath, but is covered with a kind of fibrous lining called a paratenon. At this lower end of the tendon the blood supply is very poor. This was the famous weak point of the Greek warrior Achilles. A bursa (a small sac of fluid) separates the tendon from the upper part of the heel-bone, above its attachment point, to allow friction-free movement. When the calf muscles and Achilles tendon contract and shorten they act on the ankle so that the foot points downwards into plantarflexion. When we are standing up, these are the main muscles which allow us to go up and down on our toes. Going up on the toes is a concentric movement, in which the muscles and tendon shorten against the load of the body and the effect of gravity. Controlling the return movement involves eccentric muscle activity, in which the muscles and tendon gradually lengthen out. The Achilles tendon and the calf muscles are active when we walk, run, jump and hop. The tendon’s special function is to store elastic energy and release it as required to provide momentum. This makes the actions very energy-efficient, and reduces the shock transmitted up the leg to the hip and lower back when we put our feet to the ground. The Achilles tendon can be injured in any part of its length. It can be torn (ruptured), partially-torn, strained or its lining (paratenon) can be irritated. 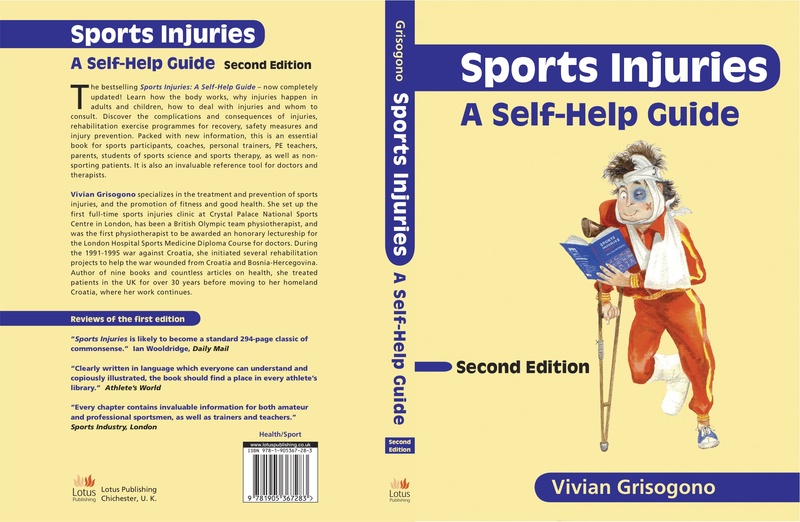 Shoes can play their part in causing injury. Wearing very high heels most of the time makes the tendon shorter, tighter and less elastic. The tendon becomes less efficient, and more prone to rupture or strain if you change from high heels to sports shoes for high velocity activities like badminton, squash, sprinting or skipping. High-backed shoes, with material or seams which rub against the tendon just above the back of the ankle can cause irritation and damage to the paratenon and the tendon itself. Imbalance in the hips or the other major muscle groups of the legs can put pressure on the lower legs and therefore the Achilles tendons. Hip problems can be a direct cause of pain in the lower Achilles tendon area. Calf cramps can contribute to stiffness and inefficiency in the calf muscles and Achilles tendon. Calf cramping is most often caused by dehydration, and sometimes, in very hot humid conditions, by salt deficiency. It can also be triggered by certain medicines, hormone treatments such as the contraceptive pill or hormone replacement therapy, or supplements such as creatine. Anything which affects the circulation detrimentally can cause cramp and therefore be a risk factor for injury, so always read the warnings on any medicines or supplements you might take, and try to look after your circulation at all times. If you have varicose veins, you should take special care of your legs, and avoid any constriction which blocks the circulatory flow.